If this sweater looks familiar, it's because I cannot stop wearing it. 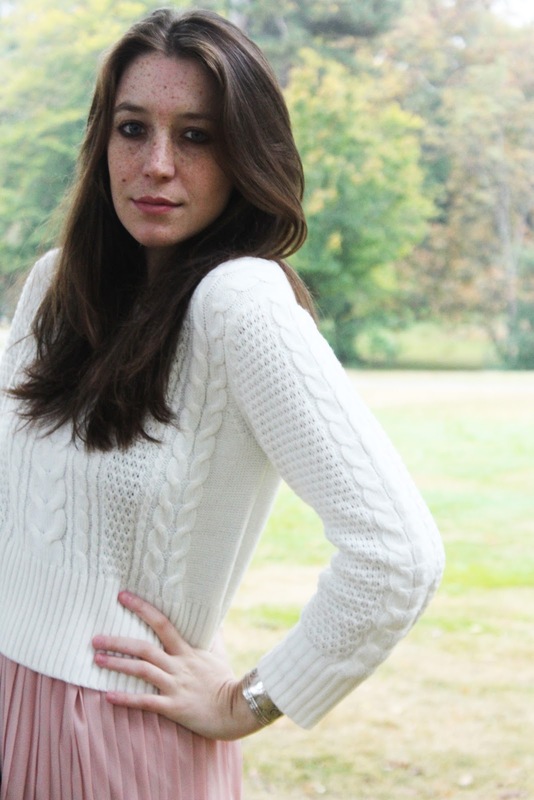 Not only is it cropped and works well with most of my skirts (high waistlines), it is white and cable knit which makes it an instant favorite in my closet. 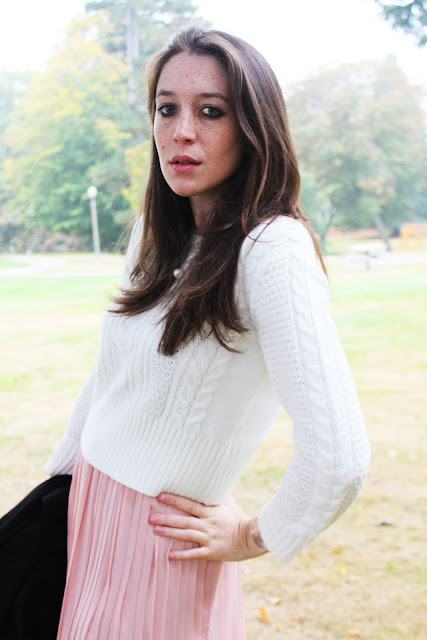 There is something about a white sweater or scarf that makes me feel instantly warm, comfortable and chic. At the rate I'm wearing this one, it may not be so white for long. What seems like overexposure in this post is largely fog. We've been enshrouded in fog every morning through midday this week and the forecast calls for the usual fall weather in the Northwest: 55 degree rain. CP and I will be struggling to get some photos in from now until May with the dreary drizzle that usually clouds up our fall, winter, and spring. I think we'll need to find a well-lit coffee shop that doesn't mind our obnoxious snapping of photos. What do you do in inclement weather for photos, fellow bloggers? I love the pretty skirt! Sometimes I'll take photos out in the rain if it's not pouring. Have a great weekend! I LOVE the pairing of that sweater with the pleated skirt! You look so lovely, I adore that pink skirt. 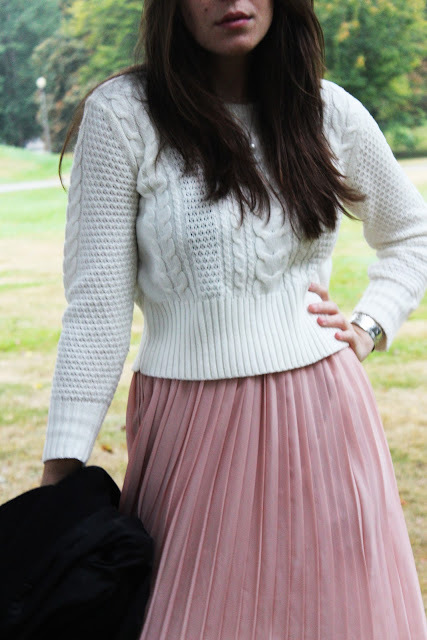 That pink skirt is darling. Such a pretty pink. Such a cute look! I really love the color of that skirt! 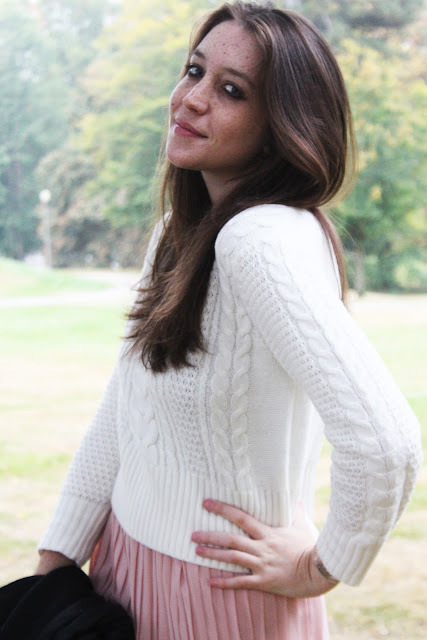 Ha, gotta find those pieces you really love and wear the heck outta them :) This sweater is so pretty and fits you so well, I see why it's a fav. 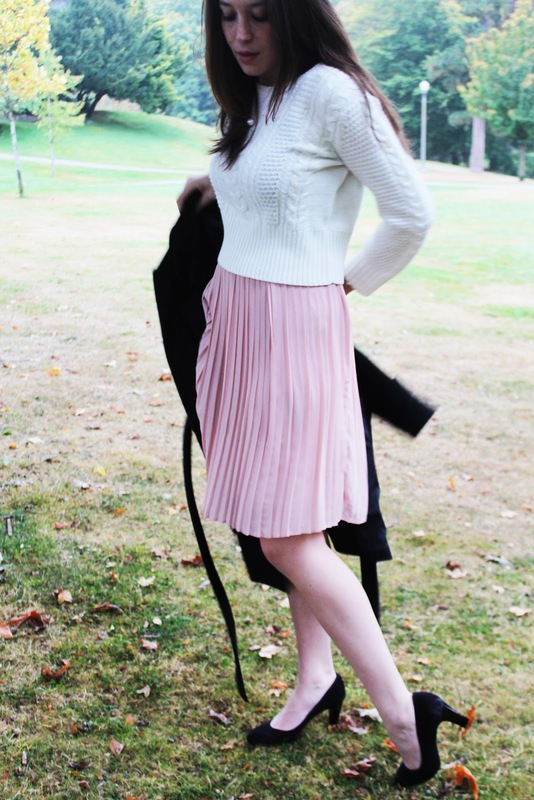 Love it with the pink pleats and black coat. Very sophisticated. This is such a simple and lovely outfit! Adorable sweater! I would also wear it often!